Get a powerful data binding component with CollectionView for Xamarin. CollectionView provides currency, filtering, grouping and sorting services for your data collection. You can use the control with the standard ListView or FlexGrid. It's based off the .NET implementation so it's familiar for most developers. 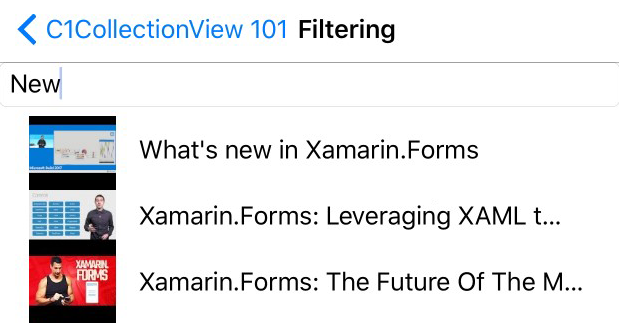 The CollectionView for Xamarin class provides data manipulation in the form of sorting, filtering, and grouping. CollectionView for Xamarin also supports the concept of currency, which keeps track of the current selected item in the data set. The object model is based off the ICollectionView interface in .NET so it’s a familiar object model for most developers. Optimize performance by loading subsets of your data as the user scrolls to the end of the list. The C1CursorCollectionView provides on-demand loading for the standard ListView or TableView control.